We have had a fantastic March, learning all about Winter on the Farm. Our Sprouts have witnessed the arrival of over 10 new lambs born here on the farm. We learned how to care for our lamb, Patches and watch her grow. She now lives with her Mom and all the other sheep and lambs in the middle pen by the Woodshed. We have two new baby lambs, Snow and Winter that we will care for until they too are ready to join the larger herd. We observed how water freezes and melts and have learned to check both Blaze our horse and Shrek our Donkey’s water buckets to ensure their water is not frozen. We enjoyed sledding, identifying animal tracks in snow and observing the beautiful decorative frost on our trees and plants. The Sprouts also helped spread hay around our raspberries to keep them warm and made pinecones birdfeeders. I am truly proud of all of their accomplishments and marvel at their sense of responsibility and caring attitude toward our farm friends. This month we will celebrate the beginning of spring and warmer weather. Please dress your child in layers, bring boots and indoor shoes, outer jackets for wet weather, hats for sunny or cooler windy days, an extra set of clothes and a water bottle. I know your child enjoys their healthy nutritious lunch or snack and we all appreciate your efforts to reuse, recycle and reduce. Please bring in one clean recycled container (no glass or metal) so we can reuse to make a special gift. Throughout the month of March we will spend more time in our garden, preparing the soil, planting seeds, watering and weeding. We will also learn more about our horse, Blaze, how to care for him and how to “tack a horse”,(using real saddles, bridles, and bits). We will make our own kites and pinwheels, finish our Winter Book and create a wonderful Spring collage. We are all learning how to count our numbers, write our names, and identify different shapes and colors. Our books for this month our “Green Eggs and Ham” by Dr. Suess, Eating the Rainbow, One Duck Stuck, and Carrot Seed. 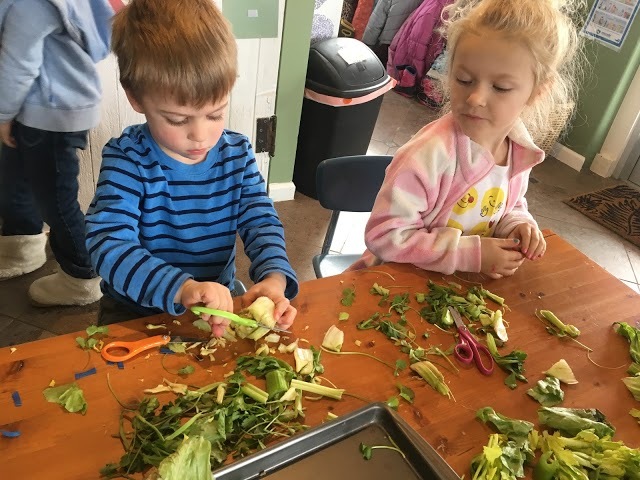 We hope to have our Sprout House End of Year Celebration with all of our Sprouts and their families on Friday, May 17 from 6-8:00 here at the farm, please mark your calendar and more details to come. We also want to plan our Spring Parent-Teacher Conferences during the middle of April, look for sign up sheet later this month. Thank you all for your continued support and kindness. Enjoy this season with your child, let them take the lead and share with you their discoveries and delights.